Here, if , and if . Assuming that information propagates with respect to a two-dimensional supersonic flow pattern at the local sound speed, show that, in order for the flow at some point to affect the flow at some other point , the latter point must lie between the and characteristics that pass through . 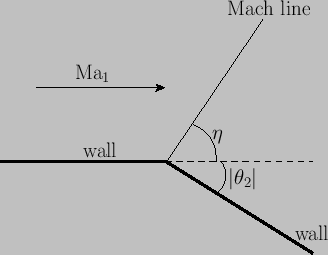 Figure: Flow of Mach number over convex corner of deflection angle . 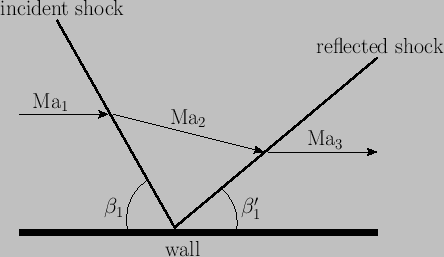 Figure: Reflection of oblique shock by wall. Here, , , et cetera, are Mach numbers. in the limit that . Hence, deduce that if then the the fan only extends over the region , and the region is occupied by a vacuum (i.e., a gas with zero pressure and density). 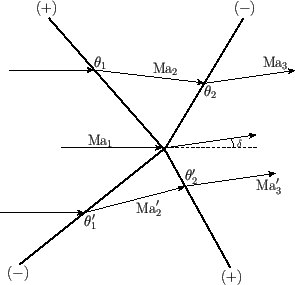 Figure: Merging of two oblique shocks of the same family produced by successive concave corners of deflection angles and . Here, , , et cetera, are Mach numbers. where is specific entropy, and the specific gas constant. It is, thus, clear that the specific entropy is not quite the same on either side of the slipstream. Figure: Crossing of two oblique shocks of different families. Here, , , et cetera, are Mach numbers, and , , et cetera, are deflection angles. 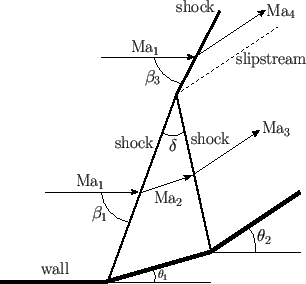 Show, that the respective strengths of the two shocks are unaffected by the intersection (at least, to first order in the deflection angles).